At first, only a few things are known about the celestial object that astronomers dub Rama. It is huge, weighing more than ten trillion tons. And it is hurtling through the solar system at inconceivable speed. Then a space probe confirms the unthinkable: Rama is no natural object. It is, incredibly, an interstellar spacecraft. Space explorers and planet-bound scientists alike prepare for mankind's first encounter with alien intelligence. Gil 'The Arm' Hamilton was one of the top operatives of ARM, the elite UN police force. His intuition was unfailingly accurate, his detective skills second to none, and his psychic powers - esper sense and telekinesis - were awesome. 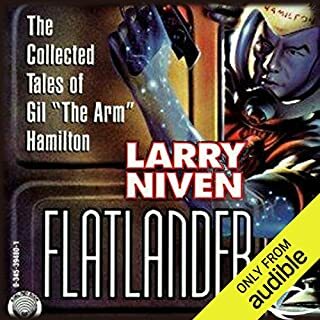 Now you can hear all the classic stories of the legendary ARM operative, collected in one volume for the first time - plus, an all-new, never-before-published Gil Hamilton adventure! It has been 40 years since the publication of this classic science-fiction novel that changed the way we look at the stars and ourselves. From the savannas of Africa at the dawn of mankind to the rings of Saturn as man adventures to the outer rim of our solar system, 2001: A Space Odyssey is a journey unlike any other. When the silent spacecraft arrived and took the light from the world, no one knew what to expect. When the Overlords finally showed themselves it was a shock but one that humankind could now cope with, and an era of peace, prosperity and endless leisure began. 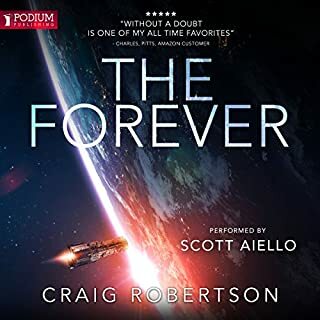 But the children of this utopia dream strange dreams of distant suns and alien planets, and soon they will be ready to join the Overmind...and, in a grand and thrilling metaphysical climax, leave Earth behind. Joe Colsco boarded a flight from San Francisco to Chicago to attend a national chemistry meeting. He would never set foot on Earth again. On planet Anyar, Joe is found unconscious on a beach of a large island inhabited by humans where the level of technology is similar to Earth circa 1700. 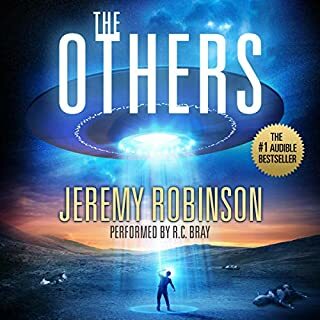 He awakes amid strangers speaking an unintelligible language and struggles to accept losing his previous life and finding a place in a society with different customs, needing a way to support himself and not knowing a single soul. Cringeworthy beginning but improved as it went along. 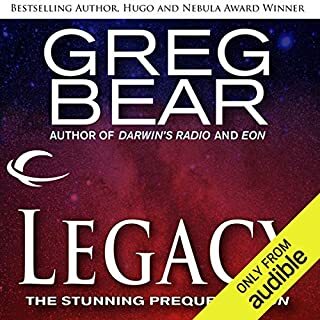 In this prequel to Eon, Greg Bear continues to explore the possibilities presented by the asteroid Thistledown, a remnant of a lost human civilization. The Way is a tunnel through space and time that leads to other worlds, some more like planet Earth than Earth itself. It is perhaps the most formidable discovery in Thistledown and with it come disputes as to the nature of the Way and how it should be used. The Way can be reached only through Axis City, the only space station of Thistledown. 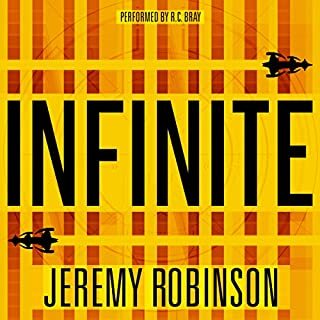 The sequel to Rendezvous with Rama: the only SF novel to sweep all SF awards and one of the best sellers of all time. Sixty-six years later, a second approaching spacecraft was detected; four years on, the Ramans are definitely returning. But this time, Earth is ready. And maybe now, with the arrival of Rama II, some of the questions posed by Rama will at last be answered. 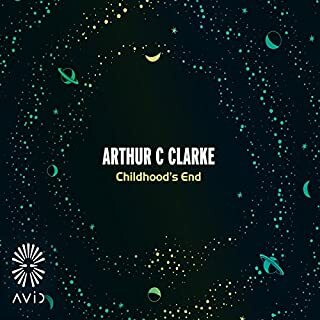 Arthur C. Clarke was born in Minehead, in 1917. During the Second World War he served as an RAF radar instructor, rising to the rank of Flight-Lieutenant. After the war he won a BSc in physics and mathematics with first-class honours from King's College, London. One of the most respected of all science-fiction writers, he also won Kalinga Prize, The Aviation Space-Writers' Prize, and The Westinghouse Science Writing Prize. He shared an OSCAR nomination with Stanley Kubrick for the screenplay of 2001: A Space Odyssey, which was based on his story, The Sentinel. He lived in Sri Lanka from 1956 until his death in 2008. 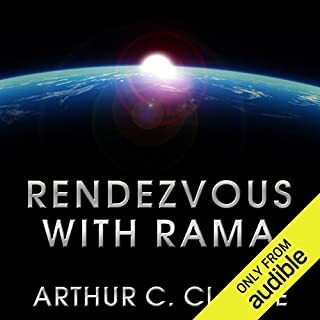 The same narrator for Rendezvous with Rama continues to be awesome for this sequel. It must have been hard for him though because the sequel, the story itself is terrible. 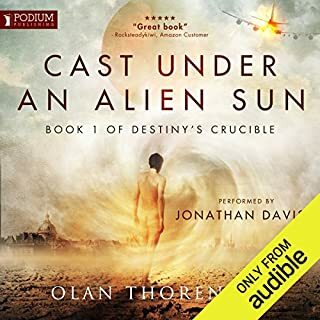 The tone of the story has changed from great classic sci-fi in the first book, to trashy unintelligent reality tv drama for the second. After googling reviews of the book to see if I should bear with it, continue to suffer beyond chapter 7, where I’m already hating it, I’ve confirmed I won’t finish it. I’m off to find decent sci-fi to replace this book. If you liked the first book then you will hate this one. Chapter 17, and drones have entered Rama 2, the rest is character building, and I mean LOTS of character building and quite a heavy push into mysticism and religion. Don’t waste your time. 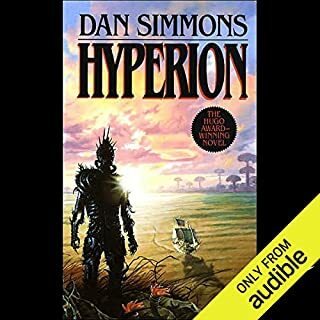 PS: The narrator was superb. What was most disappointing about Arthur C. Clarke’s story? Worst sequel I've read in a long time. 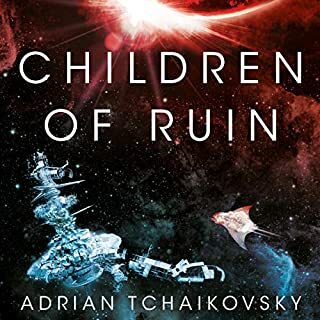 This book would be enjoyable to those who are not familiar with good sci-fi, though as they would have read the first book presumably I expect everyone will be disappointed with this book. Something not by Gentry Lee. The narrator was fine, I don't think he could much more with the material. Disappointment, this book is a terrible follow-up to Rama. It's been said before, but this book was not written by Clarke and it shows, oh how it shows. It's utterly infuriating how it focuses not on Rama for most of the book but constantly digresses into backstory of the dull characters that have been sent to meet Rama, and those backstories really are a chore to sit through. Lee just needs to get to the point, maybe the publisher had a word count limit he had to get across because my word that it drone on. All in all, not great. 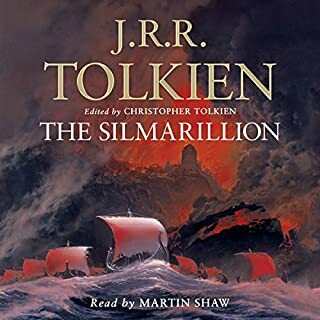 wonder by my second reading - or should I say listening of this classic. end up in space and approaching Rama II. Rama series "The Garden of Rama". and that video and audio data was still regarded as being stored on tape. would see storage capacities expand exponentially. times is head-scratchingly odd to me. books writing then this is very bad considering Gentry Lee's credentials. What did you like best about Rama II? What did you like least? The best thing about Rama II is the sense of anticipation left over from the original Rama, which was great. Has Rama II put you off other books in this genre? It's certainly put me off the kind of book that just seems to have one name to promote it and another to write it. 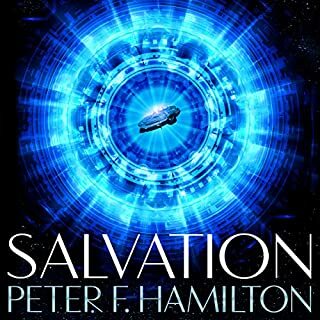 The writing style is different from the original, but with a few Arthur C Clarke tropes thrown in. Arthur C Clarke stories are speculative; they make you think 'what if' - this doesn't. Some scenes are actually (unintentionally) corny to the point of bad comedy. The opening scenes were quite good but failed to live up to the greatness of the original. 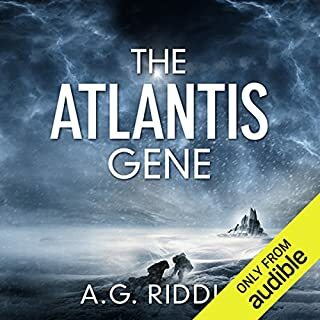 Well enough read, but this story doesn't really contain the stuff you want from an Arthur C Clarke novel - in short, quite bland. 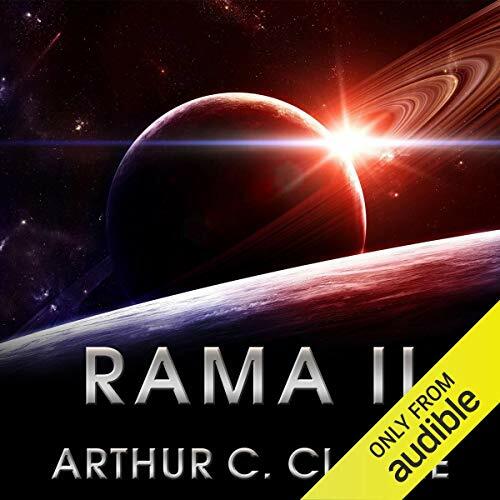 Would you consider the audio edition of Rama II to be better than the print version? I liked all the characters. All were quite sketchy and a little corny by today's standards, mind you. I guess I'd go for the American general or the mardy chief scientist. That said. most of the people in it are characters you'll love to hate. What about Toby Longworth’s performance did you like? He kept to the vintage vibe of the book very well. A rich slice of the future, 1970s style. You need to take yourself back in time to when this book was written to enjoy the future it portrays. It's a very good story of you can do that. There are some laugh out loud moments though. Why does the chief female character (medic) also have to be an Olympic athlete who had an illegitimate child with the king of England? It's all a bit 'pass the brandy and cigars - we're going to have a business meeting now'. but it's charming in its own way. 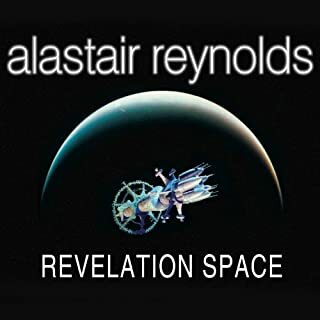 This is a sequel to the amazing first book by Arthur C Clarke. It was written by Gentry Lee and Arthur C. Clarke, though i believe the former had the majority influence. It felt like a retelling of the first story again, but with more people. It was not as much fun as the first book, as you already knew what they were going to see when they descended. There were some good character moments, and the ending screams for another book (which there are). While i do regret reading this book, i don't think i would have missed out if i didn't. The quality of the audio was acceptable. What would have made Rama II better? Jettisoning Gentry Lee before writing the novel. Its put me off any book with Gentry Lee as one of the authors. What does Toby Longworth bring to the story that you wouldn’t experience if you had only read the book? He does a brilliant job considering the vast number of nationalities that have unnecessarily been introduced into the story Some of his accents are a little....inaccurate eg. 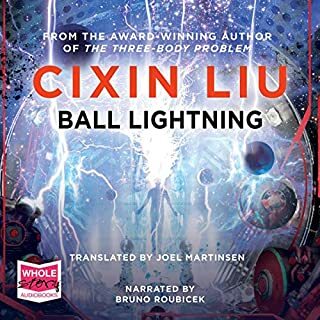 Cantonese accent instead of a Japanese accent, but he has an excellent voice for reading with gravitas as wider expression. What character would you cut from Rama II? Most of them! They were cliched, predictable, one dimensional and all far too perfect for a novel with the women being in ownership of 'long blonde hair' and exquisite fashion sense (described ad nauseum) right down to the 'dishonored' Japanese character. 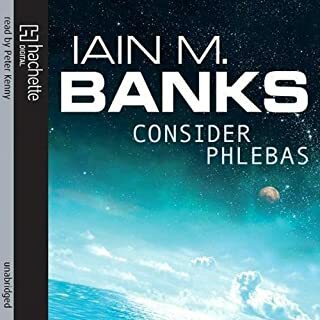 If you enjoyed the first novel and hold it as being a masterpiece, please don't listen to this follow up as it will taint your perceptions of the concept. I was desperate to know the secrets of the Ramans but now, after this awful book, I'll just let it remain a mystery. The book takes so long to get going. 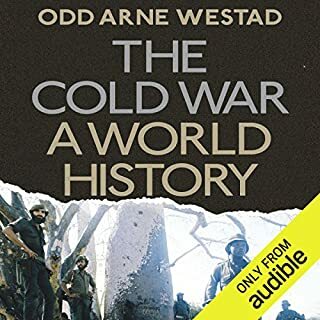 It starts off with some interesting global politics then we get much to long of an introduction to the characters(Most of which has no relevance). The whole big aliens spaceship seems to be lost in very predictable characters. The only character where the background really matters is the main character - Nicole who was interesting. Points in the story where big or strange things are happening and she starts to reminisce about her father and the chateau in France was a bit tedious after a while. Lots of questions are answered and you are left ready for where the next book will take you. Have you listened to any of Toby Longworth’s other performances? How does this one compare? Easily the worst book I have ever read. If you want science fiction look elsewhere this is more like second rate mills and boon! Nothing wrong with the narration but the storyline is complete nonsense and would be more at home in the kindergarten. The original Rama is fairly good but they obviously got a 6yr old to write this dross. 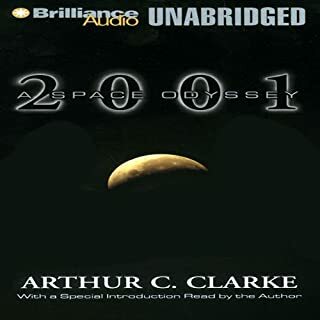 Would you try another book written by Arthur C. Clarke or narrated by Toby Longworth? What three words best describe Toby Longworth’s voice? If you could play editor, what scene or scenes would you have cut from Rama II? After the first Rama book this is a massive disappointment. It's a badly written book about feelings and personal history.